Zhelle.Dk: WIP Wednesday: Notebook cover... or maybe not? WIP Wednesday: Notebook cover... or maybe not? 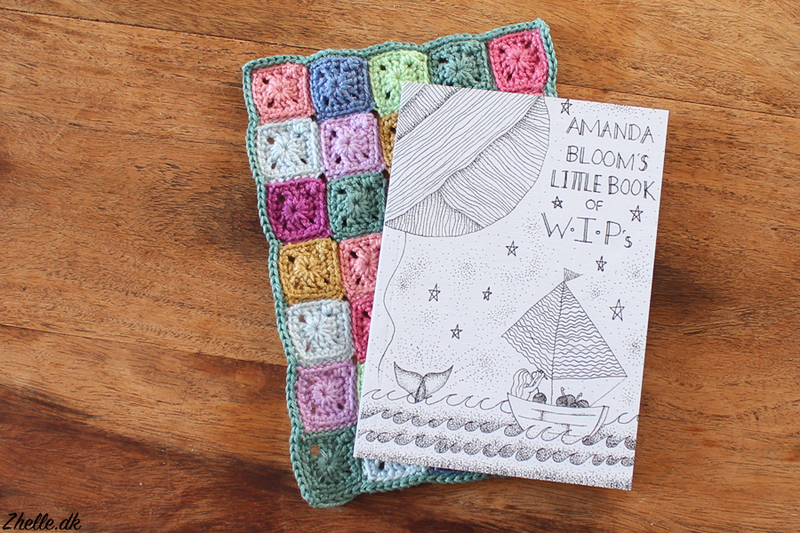 In September I started on the notebook cover from the August box of Little Box of Crochet. 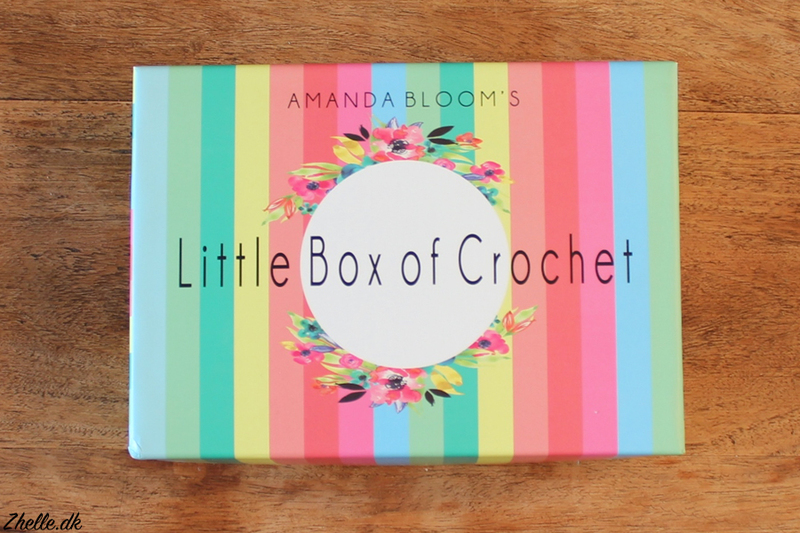 The notebook cover is for a little booklet that came in the box called Amanda Bloom's little book of WIPs. The project is designed by Lucy from Attic24 and the colours she has chosen are gorgeous! 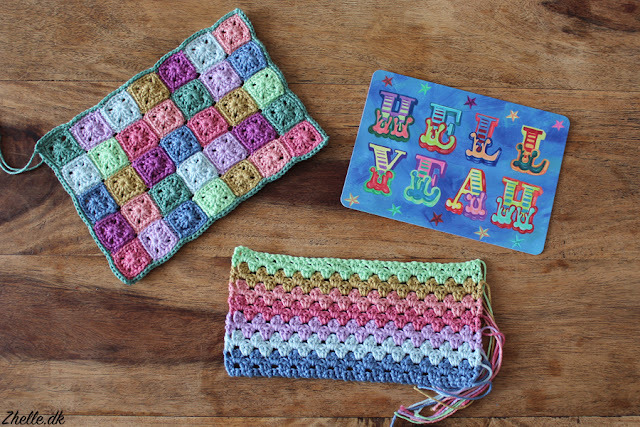 The pattern consists of 35 little granny squares. Unfortunately there wasn't a measurement for how big one square is supposed to be, so when I'd made my 35 squares it was easy to see that there was no way it would be blocked big enough to fit the notebook! As you can see on the picture, it is just big enough to fit the back of the notebook. I didn't want to make 14 more squares or so, so I had to figure out what to do instead. But it is definitely not going to be a cover for the notebook. The notebook is cute as it is, so that's alright! 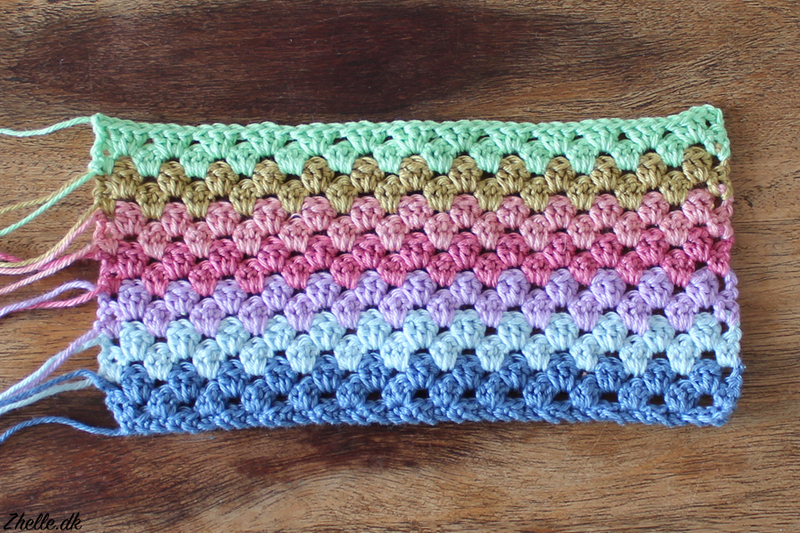 I decided to make a pouch instead. Every Little Box of Crochet comes with postcards designed by Jennie Maizels, and right now they are just stored in the boxes. I think it would be really nice to have them all stored together as a collection! That means making an extra side for the pouch. As it is Lucy who designed the project and she also made the pattern for my granny stripe blanket, I got inspired and made the second part of the project as a miniature granny stripe blanket. I used most of the colours, but I have left out two of them; a dark green and a dark purple. They are going to be used to make the edging, and I want to make sure I have yarn enough! I still need to make a 'lid' which I've decided to use a third Attic24 pattern for, and then it all needs to be crocheted together, but I am getting quite thrilled with this project!